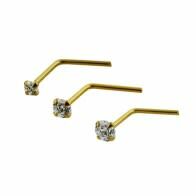 Our selection of L- shaped nose pins are exclusive and forged from best quality solid 14K gold. 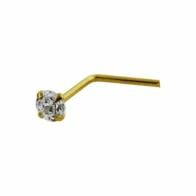 Innovative, eye catching and funky designs, assurance of the finest quality, durable and anti-allergic tested gold, great looks and above all unbelievably low prices are the things that set our gold body jewelry apart from others. 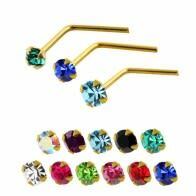 Visit our site and get numerous designs in gold nose pin that includes 14k gold nose pins and 14k l shaped nose pins.